Like The Rocky Horror Picture Show http://groupthink.jezebel.com/say-it-say-it-… before it, 1986's Little Shop Of Horrors is a lovingly camp tribute to the science fiction and horror movies of the 50s and 60s. However, while RHPS had a subversive edge, LSH is much more a product of the 80s: there's an earnest appreciation of the original material. The original LSH clearly shows the seams of being written in a week and shot in a few days. It's essentially a sitcom stretched to (barely) feature length, with a grimly weird sense of humour. Seymour Krelboin(Corman regular Jonathan Haze) is a nebbish working for florist Gravis Mushnick (Mel Welles) all while mooning over his coworker Audrey (Jackie Joseph). Seymour creates a hybrid plant from a butterwort and a venus flytrap, which he dubs Audrey Jr. Seymour soon realizes that his plant does not respond to regular plant food, but perks up when accidentally fed human blood. Soon, Audrey Jr. can talk, and demands human flesh in addition to blood. 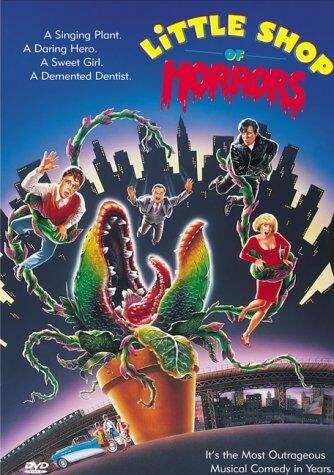 As in A Bucket Of Blood, the "accidents" escalate to murders, and Seymour realizes that it's him or the plant. The movie became a cult favourite, and in 1982 it became an off-Broadway musical written by the up-and-coming songwriting team of Alan Mencken and Howard Ashman. In adapting the movie, the pair made the plant (now dubbed Audrey II) a monster from outer space and eliminated some of the original movie's sillier characters. Two other major changes were making the sadistic dentist Audrey's abusive boyfriend who croons a la Elvis, and introducing a black girl group (named Crystal, Chiffon and Ronette) as a Greek chorus. The songs are either clever early rock pastiches or earnest, West Side Story-style ballads. One of the musical's producers was record mogul David Geffen, who was planning a move into movies. Geffen had high ambitions for LSH the movie musical, at one point seeking Steven Spielberg to produce (! ), Martin Scorsese to direct (!!) in 3D (!!!) and Barbra Streisand to play Audrey (!!!!). The eventual production was more modest, directed by Frank Oz (in his first non-Henson gig) and starring Ellen Greene (off-Broadway's Audrey) and SCTV veteran Rick Moranis. While the leads were not big draws, Geffen did have more luck with supporting roles. Levi Stubbs of the Four Tops provided the booming voice of Audrey II, while Steve Martin took to the role of dentist Orin Scrivello with gusto. Rounding out the cameos were a deliriously funny Bill Murray (as the masochistic patient, cut from the stage show but revived here) and John Candy as a cheerful DJ. Little Shop Of Horrors the movie musical was a modest hit, but its influence lives on. Moranis went on to star in Honey, I Shrunk The Kids and its sequel, while Greene had respectable a career, eventually showing up on the cult TV show Pushing Daisies. Geffen went on to form Dreamworks with Spielberg and Jeffrey Katzenberg, while Oz has had a decent career as a director. The concept of adapting old movies for stage musicals (and later adapting the musicals as movies) worked for The Producers and Hairspray. But the biggest career boost was to the original songwriters. Three years after LSH Mencken and Ashman collaborated on The Little Mermaid, and two years later on Beauty And The Beast, effectively ushering a new golden age of Disney animated musicals. (Sadly, Ashman died of AIDS in 1991, having finished only a few songs for Alladin). The musical itself was revived on Broadway and remains a community theater staple. Not bad for a story that was cooked up in a couple of weeks.